Physical Description Ishresse is short and stocky. She has blue skin and white hair that she wears tied back in a long braid. She had a round face and like all Andorians she has a pair of antennae sprouting from the top of her head. General Overview Form an early age Ishresse was a diplomat, always solving arguments between her friends and family. She was always very small and not the strongest, but she had a keen mind that she honed into a sharp tool. Personal History Ishresse was born on Andoria. She was raised and educated in the capital city. She was an only child, but she had many friends to make up for that fact. Ishresse was always the peacemaker amongst her friends and family. She did well in school, excelling in her federation history and politics classes. 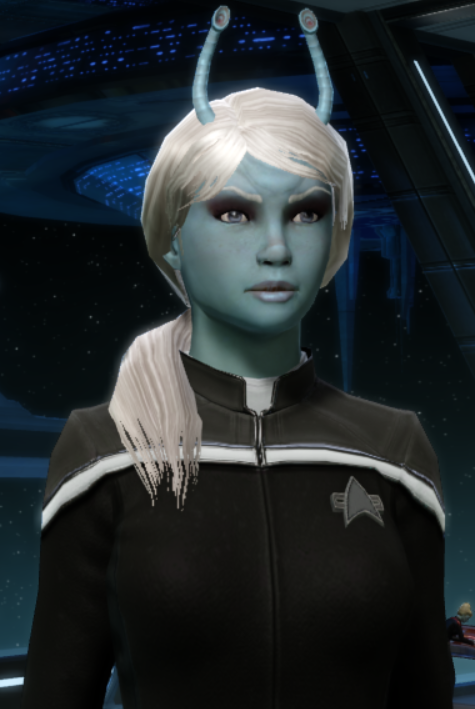 Ishresse finished her education in 2378 and immediately applied to Starfleet Academy and the Federation Diplomatic Corp.